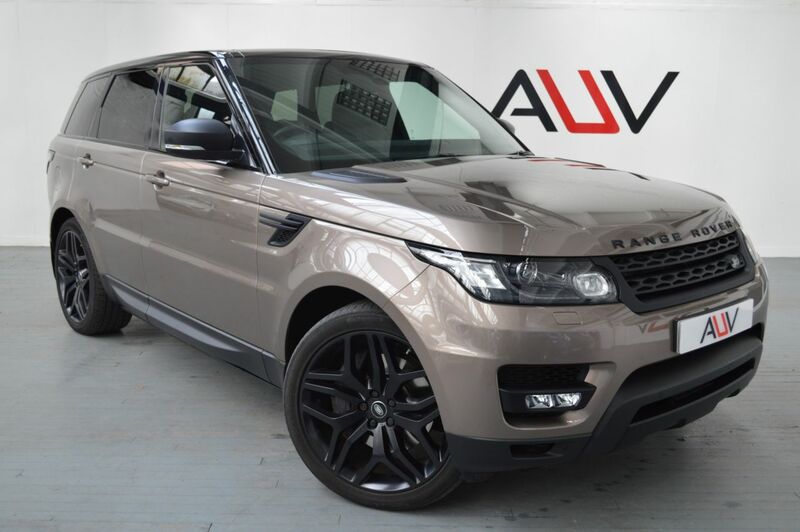 We are pleased to offer on sale this lovely Range Rover Sport HSE Dynamic with the following specification, Deployable side steps, Fixed Panoramic Sunroof, 22 Inch 5 spoke satin black alloy wheels, Black pack, Satin black bonnet louvres, side vents, door mirrors, bumper aperture, Smoked headlights, Electrically deployable towbar, Tinted windows, Front & parking aid with visual display camera, HDD Premium navigation including voice control, TMC with touch screen and media storage, Push button starter, Rear park distance control, Speed sensitive power steering, TFT Virtual Instrument Panel, Traffic sign recognition, Autonomous emergency braking, CBC (Cornering brake control), Curtain airbags, DSC - Dynamic Stability Control, Electronic traction control, Hill descent control, Keyless entry, Bluetooth audio streaming, DAB Digital radio, USB/aux input socket, Climate control memory, Front/rear passenger grab handles, Glovebox, Isofix child seat preparation, Multifunction heated steering wheel, Oxford perforated leather, Premium Noble Plated Paddle Shift, Reach/rake electric adjustable steering column , Adaptive brake lights, Daytime running lights, Electric heated, adjustable, folding door mirrors with memory, Gloss black exterior trim, Headlight washers, Heated windscreen, LED rear lamps, Rain sensor windscreen wipers, Electronic air suspension Before you reserve a vehicle we ask that you read both our Business and Warranty conditions in the 'Terms' tab above. Specialists in vehicle financing we can offer our clients market leading, bespoke funding packages. Finance examples are subject to status, regulated and monitored by the FCA. Goods and services are supplied by Approved Used Vehicles Ltd. For further information on how to reserve this vehicle or tailor your finance package please call us on 01455 446505.